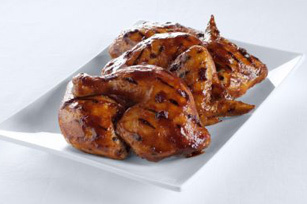 What makes our Cooper’s Famous BBQ Chicken recipe famous? It could be the saucy glaze flavoured with hickory and chipotle peppers - you’ll just have to try this grilled chicken recipe for yourself! Pour dressing over chicken in resealable plastic bag. Seal bag; turn to evenly coat chicken. Refrigerate 1 hour to marinate. Remove chicken from marinade; discard bag and marinade. Preheat barbecue to medium heat. Mix barbecue sauce and chopped pepper; set aside. Grill chicken 40 min. or until cooked through (180°F), turning occasionally and brushing with the barbecue sauce mixture for the last 15 min. of the grilling time. Chipotle peppers are smoked jalapeno peppers. Since most of the heat from the jalapenos are retained in the smoking process, these peppers tend to be very spicy. Typically located in the ethnic food aisle, they come in a variety of forms, such as dried whole, powdered, pickled or canned in adobo sauce. Remove any leftover cooked chicken from the bones; cover and refrigerate until ready to use. Then, just mix with a little Kraft Mayo Real Mayonnaise for a quick-and-easy chicken salad! After handling raw chicken, wash hands in hot soapy water and do the same with anything else that has come into contact with the raw chicken.